ArbLit was launched by Luca Radicati di Brozolo and Michele Sabatini after they broke away from leading Italian firm Bonelli Erede Pappalardo in 2013. The Milan-based outfit made its debut in the GAR 100 in 2015 and was recognised at the GAR Awards in the same year. A well-known name in Italy, Radicati di Brozolo is also highly regarded for his expertise in EU and antitrust law, and was head of the competition department at Italy’s Chiomenti Studio Legale in the 1990s, when he also headed the firm’s Brussels office. He joined Bonelli in 2001, later heading its London disputes desk. Also a door tenant at Fountain Court Chambers in London, he sits as arbitrator at the ICC, the LCIA and ICSID, as well as the Milan Chamber of Arbitration and the Geneva Chamber of Commerce and Industry. In addition, he is chair of private international law at the Catholic University of Milan and a former vice chair of the International Bar Association’s arbitration committee. Sabatini also sits as arbitrator in ICC cases and the Milan chamber. He is a member of the Milan and New York bars, and has particular expertise in FIDIC disputes. The other name partner is Massimo Benedettelli, who joined in 2014 from Freshfields Bruckhaus Deringer in Milan and is a vice president of the ICC Court. He is also an arbitrator and professor of international law. Marco Torsello, who had been of counsel at the firm since 2014 and heads its Italian litigation team, was made name partner in 2017. Telecom Italia, Enel, Tenova, STE Energy, Impresa Pizzarotti and Finmeccanica are among the firm’s major Italian clients, while international names that have used it include BNP Paribas, Deutsche Bank and steelmaker ThyssenKrupp. In the investment treaty sphere, it has been representing a group of European energy investors in six UNCITRAL claims against the Czech Republic relating to the repeal of economic incentives in the country’s solar power sector. ArbLit was brought in by the claimants to replace another firm. Together with Quinn Emanuel, ArbLit helped US insurer AmTrust settle a €3 billion dispute with its former Italian business partner in 2016, after winning the disqualification of an arbitrator accused of taking a bribe. Italy’s Supreme Court upheld the challenge in 2017. The firm has also assisted AmTrust in follow-on litigation against the arbitrator. A team led by Benedettelli scored a victory for Telecom Italia’s Brazilian unit TIM in 2016, helping it defeat a US$150 million ICC claim that concerned allegations of fraud. The dispute related to a merger deal with a prominent Rio de Janeiro businessman. In the same year, Radicati di Brozolo helped Italian engineering client Consta win a €20 million Permanent Court of Arbitration award against the governments of Djibouti and Ethiopia. The dispute, heard under European Development Fund rules, concerned a deal to renovate a railway between the two states’ capitals. The firm is now representing Consta in a potential investment treaty claim against Ethiopia, after the award was annulled by the Ethiopian Supreme Court. In 2013 and 2015, the firm won favourable jurisdictional rulings in two trailblazing ICSID cases against Argentina, brought on behalf of Italian bondholders affected by the state’s debt default. Although the two cases were later discontinued, the decisions will stand as valuable precedents for future treaty claims over sovereign debt. There were developments in two of the firm’s Czech solar cases. It secured an award on liability for client Natland Investment Group, which found that reforms to the renewable energy incentives breached the state’s Energy Charter Treaty obligations. Damages are still to be determined, but the arbitration has been paused while the Czech Republic challenges the award in the Swiss courts. However, a separate ECT claim worth US$14 million that the firm brought on behalf of German renewable energy investor Antaris Solar and its founder Michael Göde was dismissed. The ICC instructed the firm to defend it in Italian court proceedings brought by an Italian company for alleged breach of the contractual duties owed in its capacity as appointing authority. The case was dismissed. ArbLit has been acting for Italian engineering company Tecnimont for the latest stage of a long-running ICC arbitration against J&P Avax over the construction of a plastics plant in Greece. Avax seeks the revision of a partial award on liability on grounds of fraud. Radicati di Brozolo has been busy as arbitrator. He was part of a five-member tribunal that handed down a US$650 million award in early 2019 in favour of a subsidiary of Brazil’s O against other shareholders in Angolan mobile carrier Unitel. The claims in the case totalled US$3 billion. He’s also chairing an ICC panel hearing a claim brought by a subsidiary of China National Petroleum Corporation against Costa Rica’s oil and gas-refining monopolist Recope, over a cancelled US$1.5 billion project to upgrade a refinery. Benedettelli was appointed as a vice president of the ICC Court. Torsello became a member of the ICC commission on arbitration and ADR and the panel of arbitrators of the Thailand Arbitration Centre. Simone Arena of Italian construction company PizzaRotti says the firm is well-acquainted with the main technical issues which may arise in construction disputes. 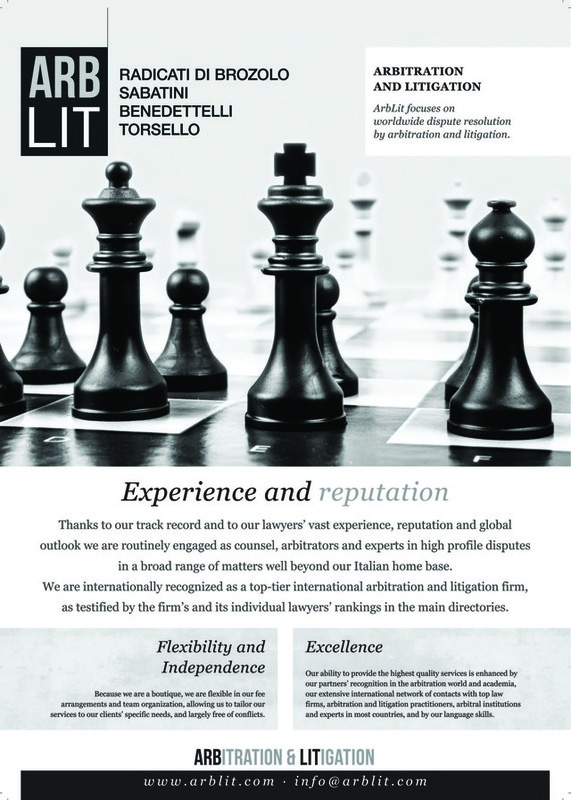 ARBLIT is the first boutique in Italy entirely dedicated to the resolution of international disputes by means of Arbitration and Litigation. Thanks to our lawyers’ vast experience, reputation, and global outlook, complemented by academic standing, we are routinely engaged in high profile disputes in a broad range of matters, well beyond our Italian home base. Our ability to provide the best services is enhanced by our language skills and extensive international network of contacts with top law firms, arbitration and litigation practitioners, arbitral institutions and experts in most countries. Also for this reason, we are frequently involved in cases with no link to Italy or Italian law. By combining a lean structure with expertise of the highest quality acquired in premier league law firms, we are able to offer services of the excellence usually associated with such firms, with the flexibility and lower costs of a boutique. We are therefore in a position to offer competitive fee arrangements that can be tailored to the clients' individual needs and that allow us to take on cases involving smaller amounts. Our boutique size allows us also to be largely free of the conflicts that are an increasing concern in large firms and that previously affected our ability to take on cases as counsel or arbitrators. ArbLit is now internationally recognized as a top-tier firm in the international arbitration and litigation sector as testified by our rankings in the principal directories.